Why is Botox the Little Black Dress of Aesthetic Medicine? Why is Botox is the Little Black Dress of Aesthetic Medicine? You know that one dress in your closet that always looks fabulous? The one that you reach for when you need to win at the confidence game? In the world of cosmetic medicine, Botox is the equivalent of your feel-good dress. A treatment that only takes 15 minutes but has far-reaching powers; making you feel beautiful and comfortable in your own skin. Botox® is the number one non-surgical solution to treat lines and wrinkles world-wide. It has both corrective and preventative properties and excels in smoothing away fine lines and deeper wrinkles on the forehead and around the eyes. 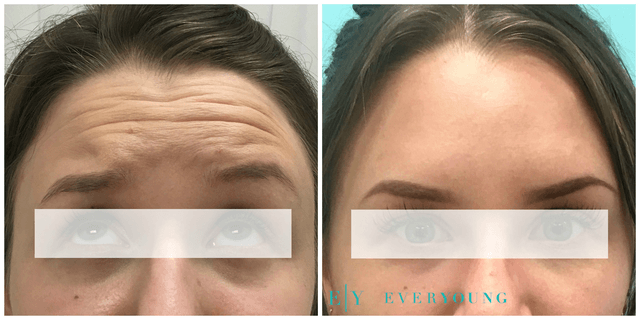 Of all cosmetic procedures, this one gained popularity because it works, and because the effects in the hands of a skilled injector are both dramatic and subtle, meaning you look younger and refreshed, but no one will know why. We’re sure you’ve seen the scary photos of actresses whose foreheads are large shiny bricks—incapable of expressing any emotion. This is a sign of an unskilled injector. When assessing the face, the medical doctors at EverYoung take each person’s unique physiology into consideration; including natural asymmetries and facial expressions. The goal is not to immobilize all movement—but to soften the lines and wrinkles while still allowing for natural facial movement. You can still make an angry face—you’ll just look better while doing so. Much like that one dress in your closet that is basic but spectacular—in the world of cosmetic medicine, Botox® or Dysport often provides the starting point that lets your beauty shine through. Feeling like the best version of yourself and moving through life with confidence is always the goal we hold in mind for our patients.